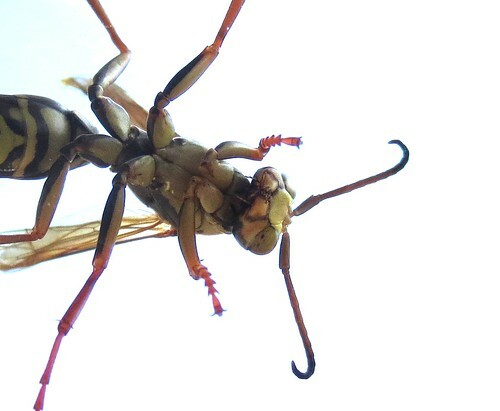 This is a medium-sized, predatory, social wasp. Adults are ⅝″ to 13 ⁄16″long. The body is slender. The head and thorax are covered with extremely short, inconspicuous hairs. The color pattern is geographically variable. Three subspecies are recognized. There are two large compound eyes, one on each side of the head; and three small simple eyes (ocelli) at the top of the head between the compound eyes. The area below the compound eye (gena) is wide from the back of the head to the jaw (mandible), not tapered. There is a band on the gena that reddish-brown, yellow, or partly both. The plate that makes up the face is pointed at the end. It is yellow or reddish-brown and has no black marks. The antennae are long and thread-like, not clubbed. They are brownish-black above, yellow below. On males they are conspicuously curled at the tip and the last four segments are entirely brownish-black. The dorsal surface of the thorax (pronotum) is black with no stripes down the middle. A yellow or reddish-brown band at the leading edge of the pronotum is continuous, not interrupted at the apex (nearest to the head). The abdomen of the female has six segments, while that of the male has seven segments. The base of the abdomen is constricted, forming a waist, but not stalked. The upper plate (tergum) of each abdominal segment is brownish-black with yellow or reddish-brown markings or both. The first tergum is wider than long, not stalk-like, and the leading edge is gently rounded in profile. On males, the hind (posterior) margin of each tergum has a narrow band of yellow or reddish-brown. These may be absent on females in the northern part of the range of this species. The legs are long and yellow. On the middle leg the fourth segment (tibia) has two spurs at the end. The claws at the end of the foot (tarsus) are simple, not forked. The wings are smoky and clear. When at rest they are folded over the body. The forewing has three submarginal cells. The first discoidal cell is very long, about half as long as the entire wing. The first subdiscoidal cell does not touch the medial cell. Liquids and solids derived from kneading captured caterpillars and other insects. In the spring a queen emerges from hibernation. In early May she builds an above-ground, uncovered nest hanging from a slender stalk (pedicel). The papery nest is constructed from wood fibers chewed and cemented with saliva. Often two or more queens will build a nest together but one queen always dominates the nest. All of the queens lay eggs but the dominant queen eats the eggs of the other queens. After the nest is built the non-dominant queens may be driven off or become workers. The dominant queen deposits a single egg into each cell. These first young become workers and take over the care of new young and the expansion of the nest. In late summer, when food is abundant, the queen begins producing males and new queens. Nests do not survive the winter. Old queens, males, and workers are killed by cold weather in the fall. New queens mate in the fall and then quickly hibernate. In the spring queens recently emerged from hibernation congregate together. At this stage they aggressively defend their territory. In the spring and summer, when larvae are present in the nest, workers will aggressively defend the nest. In the fall, when no larvae are present, they will usually flee from predators. In insects, the area below the compound eye. In birds, the feathered side (outside) of the under mandible; the area between the the angle of the jaw and the bill. The upper (dorsal), hardened plate on a segment of the thorax or abdomen of an arthropod. Plural: terga. Photographed at the Turtle River State Park, North Dakota (25 June 2011). Thank you to 'Vespula vulgaris' (@Bugguide.net) for confirming the identity of this specimen! Photographed at Fisher, Minnesota (06 October 2011). 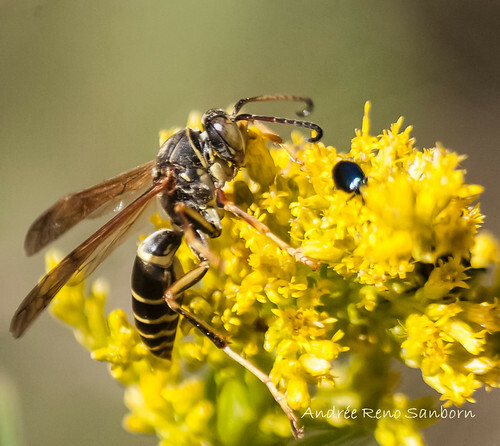 Thank you to 'Vespula' (@Bugguide.net) for confirming the identity of this specimen! Paper Wasp Larva covering its comb/cell.